The gloves are off in the West Oldham by-election if UKIP’s latest leaflet is anything to go by. While the legal small print at the bottom identifies the leaflet as the work of the UKIP election agent — it does not mention the party by name. This comes after UKIP complained loudly that presenting Nigel Farage’s views as UKIP policy was misleading. This leaflet is a despicable and obvious attempt to smear Jeremy Corbyn and the Labour Party. UKIP should be prosecuted for fraud. Any chance UKIP could stick to the truth. A blatant slur. I would have added that Corby. Also supports IRA terrorism! Ask Cllr Roberts to show you the reverse of the leaflet, and all will become clear. Those throwing their toys out the pram should be aware that Labour have applied identical tactics against UKIP in the past. Take a look at their track record before complaining about it. Also this leaflet does not seem to make the claims you say it does. Here’s my personal take, nothing official. A party is its people. The majority of Labour members support Corbyn and his views. Therefore, the leaflet gives a fair observation. Didn’t see the Labour supporters complaining when the exact same thing was done to UKIP during the run up to the election. Double standards? 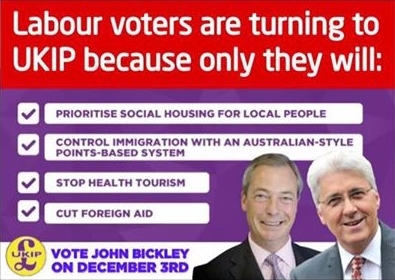 Labour pointed out what UKIP stood for – which they may well not want the electorate to know about for obvious reasons – but these are blatant lies! You lot are so gullible. Pity they did not include the fact he will not protect this country if we were under terrorist attacks. Also for all the ones complaining and asking if it is illegal for this leaflet to be published, I suggest you ask the Labour party, because it is exactly what they have done in past elections. This is hilarious. I saw in May Yvette ‘refugees welcome’ Cooper threatening a return to Thatcherism with Ukip. Pot kettle black sore losers. what you idiots fail to realise is that this is more propaganda being shovelled down your throats. It is time to WAKE UP britain. They forgot supporter of terrorist organisations ,hypocrite, liar and two faced.I fail to see how this laflet can smear this pathetic excuse for a politician or his pedo party.Long may he stay as leader because he makes Michael foot look appealing. It says “polices of the Labour leadership”. Corbyn is the guy who leads Labour and these are his policies. The only recently elected him. The leaflet is materially correct. If you vote for Labour this is what you are supporting. I find it very revealing that those clearly opposed to Labour are, in the main, foul mouthed and blatantly insulting to all that they oppose. This, I believe, indicates that we of the left are hitting sore spots and are enraging those who have no intellectual argument to offer in support of their unreasoning prejudices. UKIP will be getting my vote on Thursday.